“A large number of constituents have complained to me and I was in Swanley on Saturday, 9 November to discuss this matter. Although these car parks are not owned or under the control of the local authorities (either Swanley Town Council or Sevenoaks District Council) I spoke to the Mayor and other Councillors and I know they are actively checking the legal position. Michael was named the Minister of the Year recently at The Spectator’s Parliamentarian of the Year Awards 2013 for his current role as Minister of State for Business and Energy. “I am in government to get things done and I have been very lucky to be a minister in two departments where we have been able to make things happen; from the hugely successful privatisation of the Royal Mail, to reform of the electricity market. Michael visited three small businesses in Eynsford recently; Norman’s Butchers, Sefton Horn Winch (designers of prestigious commercial kitchens and restaurants in the UK and overseas) and G.D. Partnership, (structural engineers involved in major retail developments throughout the UK) all took the opportunity to explain their operations. 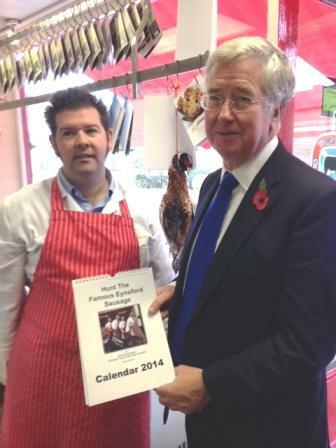 Norman’s Butchers have recently launched their 2014 Calendar entitled Hunt the Sausage, a 12-page gem featuring photographs of the village with sausages hidden within them. Images include Eynsford Castle, The World Garden, The Ford, and the butcher boys themselves. “I was delighted to visit these three small businesses in my constituency as well as having the opportunity to discuss the current economic climate with various business owners and explain what the government is doing to help Small and Medium-sized Enterprises (SMEs) to grow and reach their full potential. The Secretary of State for Education, Rt Hon Michael Gove MP has responded to the letter from Michael Fallon MP which was urging speedy decision in relation to the provision of a grammar school in Sevenoaks. Responding to Michael’s letter, Mr. Gove said: “I understand the difficulty pupils and families face in securing a suitable school place, and the distance many have to travel. Primary legislation prohibits the introduction of new selective schools and we must judge the proposals carefully to test whether they represent new schools or expansions. I write in relation to your pending decision regarding the proposals for a grammar school in my Sevenoaks constituency currently submitted, from the Valley Invicta Academy Trust and from the Weald of Kent Grammar Academy Trust. Sevenoaks is the only major town in Kent without a grammar school. This is a long running grievance amongst the Sevenoaks parents and pupils. It means that, despite living in a county that has grammar schools, Sevenoaks children not only find it harder to secure a place but, if they do, often have to travel considerable distances to take it up. Kent County Council’s figures from 2009 show that 91 out of 253 pupils who passed the 11+ in the Sevenoaks areas did not get any of their four preferences on National Offer Day. These children will have been given an alternative offer but typically one many miles away from their homes. Whilst many children do get their first choices on appeal, this is only often after many stressful months of challenges to the system. Recent figures from Kent County Council show that 1,151 students who live in south Sevenoaks, travel to selective schools in Tonbridge, Tunbridge Wells or further afield, as there is no selective provision in Sevenoaks. Moreover, as the number of Year 7 pupils increase in these schools, the application of the distance criteria through the admissions process will result in selective provision becoming increasingly less accessible for Sevenoaks south students. Non-selective schools are, thanks to your funding, able to expand to meet increased demand. It cannot be fair that those choosing selective schools are discriminated against because the system cannot similarly accommodate them. It is clear to me that the long-term solution is to provide more grammar school places locally to meet this demand. As nearby grammar schools are already full, the obvious solution is to provide new places in Sevenoaks itself. I urge you to make a speedy decision. 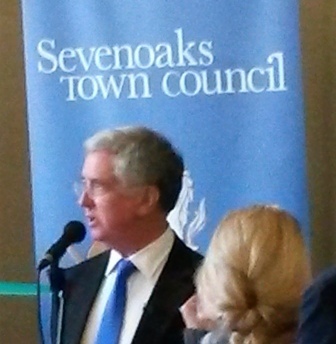 Sevenoaks MP and Business Minister Michael Fallon welcomed the ONS figures which were published today showing unemployment has continued to fall in the UK. The number of unemployed claimants in the Sevenoaks constituency in September 2013 was 750. This figure is 236 lower than in September 2012 and 47 lower than in August 2013. The number of claimants up to the age of 24 was 205 in September 2013, 100 lower than in September 2012. “Small and medium-sized enterprises (SMEs) have a really important role in getting the UK back onto a solid economic foundation. They account for 49% of private sector turnover, employ close to 60% of the UK workforce and represent over 90% of UK businesses. The 2012 Funding for Lending Scheme has now been now extended and skewed towards SME lending. 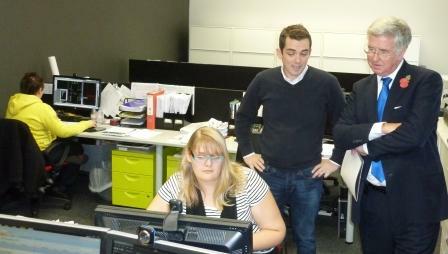 “Rockdale Housing Association has a fantastic story. 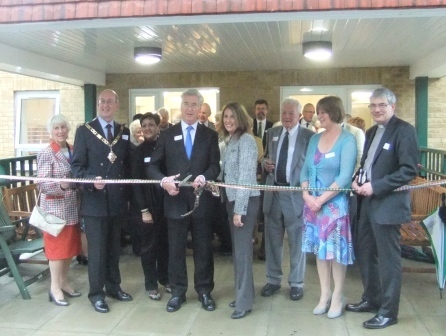 Set up 65 years ago it has continuously provided housing and care for older people in Sevenoaks and this new project shows the affection in which Rockdale is held. It must be an obligation as individuals, families and the community to help provide such resources for future generations and personally I am extremely proud to represent a town which cares so much. “Sam Footitt had led the Appeal Board tirelessly and he and his colleagues should be congratulated for all their considerable efforts over the years, started well before The Big Society was ever mentioned, which have culminated in this magnificent building which will now accommodate 48 residents. Michael has welcomed the Government’s announcement that will see train operators’ ability to increase fares capped at two per cent. “Travel costs are one of the biggest outgoings for hardworking families in Sevenoaks and Swanley. This government is introducing a series of measures to help families with the everyday cost of living. We’ve already frozen fuel duty and council tax. “The two per cent cap will keep down fare increases and help prevent the large rises commuters have seen in the past”. 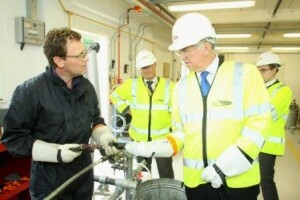 Michael visited a UK Power Networks training centre near Sevenoaks recently. He was there to learn about the company from Murdo Allan, director of health, safety, sustainability and technical training, as well as hear about the company’s business plan for 2015 to 2023. Other senior managers were on hand during the hour-long guided tour, showing Mr Fallon the variety of the 120 courses available at the centre, which plays an important part in training 60 apprentices each year how to maintain and repair underground cables and overhead lines. As Minister of State in the Departments of Energy & Climate Change as well as Business, Innovation & Skills Michael, who has responsibility for security of electricity supply as well as smart grids, said: “It has been very interesting to learn more about UK Power Networks’ training centre at Sundridge and the vital work it does for my Sevenoaks constituents and the wider community. “Training and safety are obviously top priorities for the company, helping to fill important roles within the organisation for the benefit of customers. 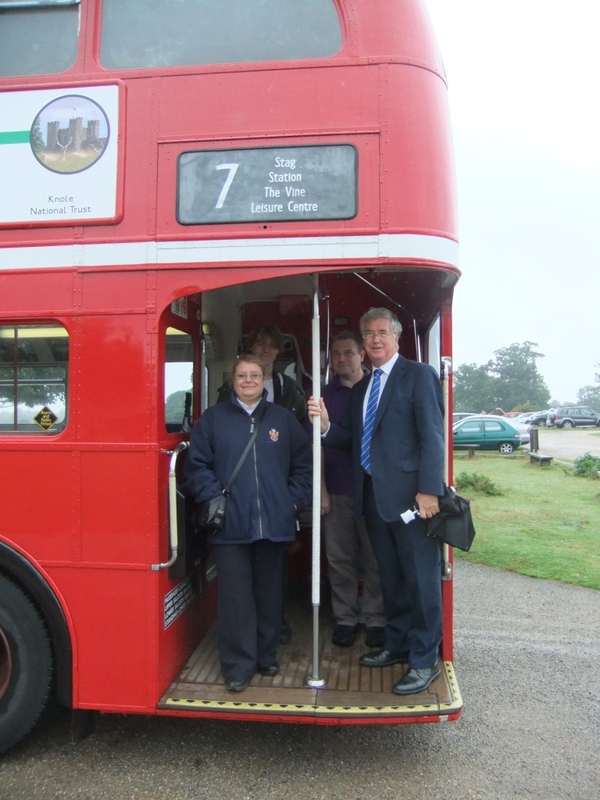 The distinctive vintage double-decker red bus which has been seen around Sevenoaks all through the summer had a new conductor on board last week. 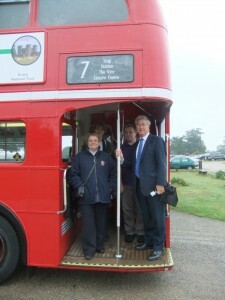 Michael met passengers alighting at Knole and dropping off at the main points of the journey around the town. He met visitors who were from far and near – all said how much they appreciated and enjoyed the service. Some young children were having an adventure as they had never been on a double-decker before whereas others were just appreciating a trip from Knole House into town to do a little shopping and visit the Food Fair on the Vine before returning home. The bus, which had been sponsored by Sevenoaks Town Partnership with assistance from Go Coach, Knole, Sevenoaks Town Council, Sevenoaks District Council, Sencio, Stag and all the volunteer bus conductors will not run after the end of September but all involved are hoping that it will return in the spring 2014.